From Bierbrouwerij De Koningshoeven inside the walls of the Koningshoeven Abbey in the Netherlands comes the Official Trappist Ale “La Trappe Quadrupel Oak Aged” from batch #21. The beer pours a brown colour with a very light brown head. The aroma consists of dark fruits, plums caramel, and bananas. The flavour is of dark fruits, plums, banana, caramel, yeast, bubblegum, caramel, oak, vanilla, sweetness and some mild alcohol. The alcohol content comes in at 11% with an IBU of 16. This is a great fully flavoured quad and I am glad that I came into possession of a bottle. Commercial Description: This unique Trappist ale owes its balanced flavour and woody aroma to the aging on wooden barrels. The taste varies from batch to batch and depends on the type of barrel in which the ale has been matured. This beer can be stored for many years, continues to ferment after bottling and is a real treat for the true beer lover. Several different types of barriques are used for the oak-aging process, both new and used ones. New barrels impart the tannins that give the beer a flavour that is reminiscent of vanilla and almond. The use of different kinds of barrels leads to surprisingly interesting flavour combinations. These flavours depend on what drink these barriques contained before, such as port, whiskey, wine, cognac, or bourbon. And the type of oak also comes into it. This beer’s final taste therefore varies from one batch to another. The Oak Aged Batch 21 has a dark brown mahogany colour and a beige brown head. The soft aroma immediately reminds you of walnuts. Accompanied by a slightly smoky aroma, you can detect oak, caramel malt, alcohol, vanilla and, of course, French brandy. The flavour, although balanced, is not particularly mellow. The brandy barrels have clearly left a lot of wood influences, which manifest themselves in vanilla and almond. Additionally, the Quadrupel has a caramel-like, slightly sweet flavour with a good, full body. The flavour ends with a slightly burnt tone and a hint of wood tannin. Due to the light tingling of the carbonic acid, combined with the wood flavour and sweetness of the beer, the sensation in the mouth is full and pleasant. 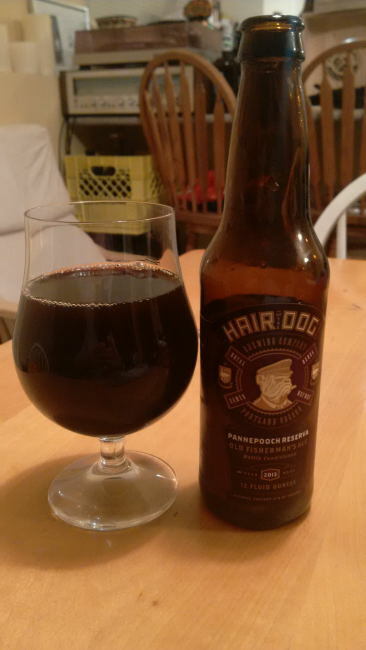 From Portland, Oregon’s Hair of the Dog Brewing Company and Belgium’s De Struise comes their “Pannepooch Reserva 2013 Old Fisherman’s Ale” a Belgian Style Quadrupel in theory. The Brewmaster from De Struise came to Hair Of The Dog and brewed a version of his Pannepot remaned Pannepooch Reserva”. The beer pours a brown colour with red hues and no head. The aroma consists of malts, dark fruits and strawberry jam. The flavour is of sweet dark fruits, candied sugar, cherries, molasses, plums, tootsie rolls, strawberry jam, malts, and some alcohol. The alcohol content comes in at 13%. The beer was as odd as it sounds but at the same time it was amazing. I would love to get my hands on another bottle but due to scarcity and cost I doubt that will happen. 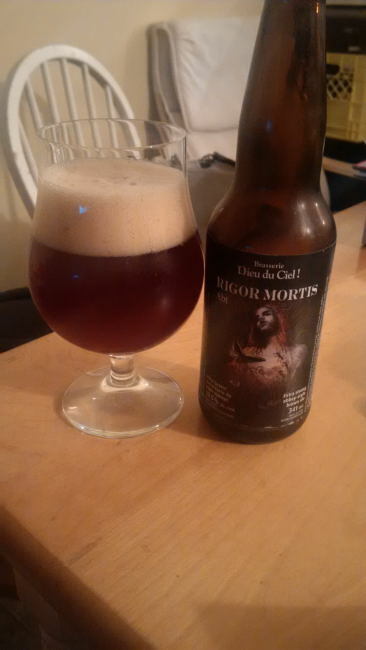 From Montreal Quebec’s Brasserie Dieu Du Ciel comes their “Rigor Mortis Abt” a Belgian Style Quadrupel. This Quad pours a deep ruby brown colour with a tan head. The aroma consists of deeply of dark fruits, brown sugar and caramel malts. The flavour is of dark fruits, brown sugar, sweet caramel malts, some hops bitterness and a mild alcohol warmth. The alcohol content comes in at a big 10.5%. This is a very well made beer and has similarities to the beer Trappist monks brew. I look forward to having more of this beer in the future. Commercial Description: Strong brown ale inspired by the beer brewed by Belgian Trappist monks. 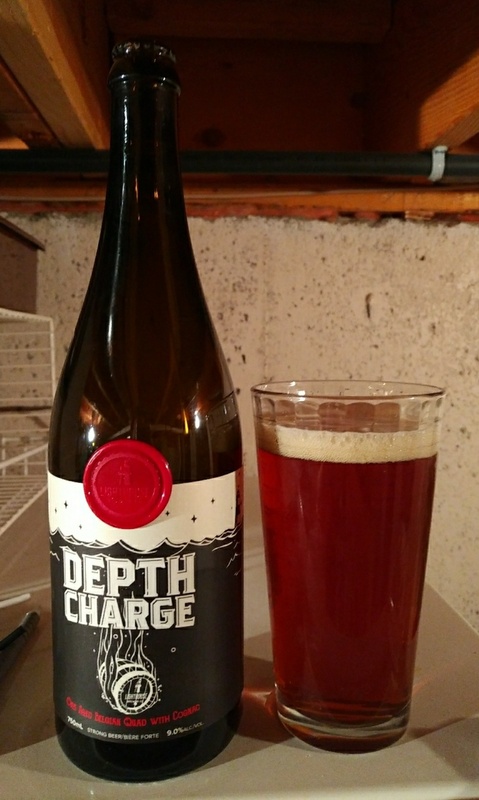 Very little bitterness, this beer has intense malty and sweet flavours, mixed with the taste of chocolate and caramel. It presents complex red fruit and spice flavours due to the type of yeast that is used during the brewing process. This beer is at its best only after it has aged for six months. The Rigor Mortis are complex beers designed and brewed with patience and care in the tradition of the great Belgian Abbey beers. Rigor Mortis Abt is brewed only once a year, and is sold in January until stocks last. 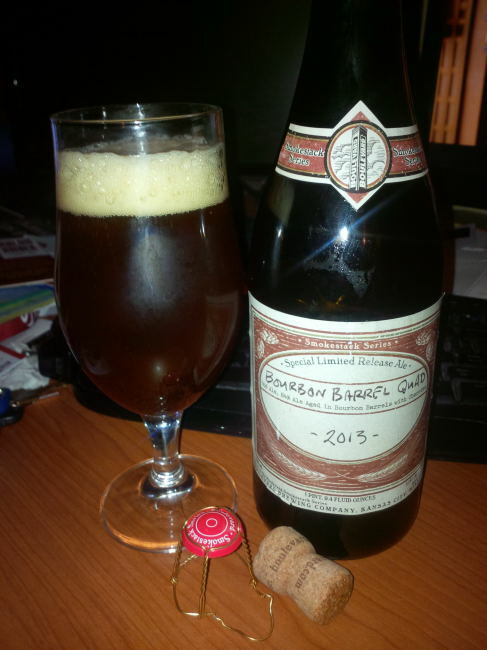 Bourbon Barrel Quad 2013 – Boulevard Brewing Co.
From Kansas City Missouri’s Boulevard Brewing Co comes their “Bourbon Barrel Quad 2013” part of their Smokestack Series a series of big bold high alcohol beers. This beer says its number 6 in the Smokestack Series. The beer pours a rusty colour with an off white head. The aroma consists of malts, cherries, dark fruits, Belgian yeast, oak, bourbon and a hint of banana. The flavour is of bourbon, cherries, dark fruits, Belgian yeast, oak, malts, vanilla, caramel, cinnamon, oak, banana and a boozy finish. The alcohol content comes in at 11.8% with an IBU of 26. This is a very tasty and big ale and I am happy that I was able to procure a bottle. Commercial Description: Based loosely on the Smokestack Series’ The Sixth Glass, this abbey-style quadrupel is separated into a number of oak bourbon barrels where it ages for varying lengths of time, some for up to three years. Cherries are added to make up for the “angel’s share” of beer lost during barrel aging. Selected barrels are then blended for optimum flavor. The resulting beer retains only very subtle cherry characteristics, with toffee and vanilla notes coming to the fore.